So as you know, Geeks Who Eat originally started as part of DAPs Magic‘s Geek Eats. We wanted to go out on our own and explore food (and cocktails) in ways that didn’t quite fit with the DAPs model. Sarah still periodically contributes over there and we absolutely adore Mr. Daps! 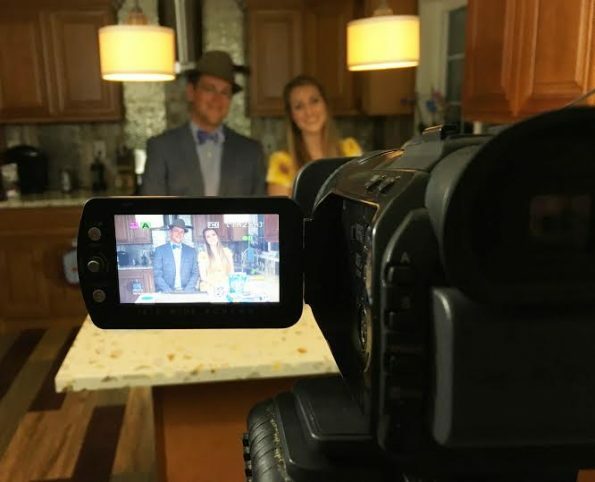 So when we found out that he partnered up with Kellie Knezovich and Pretty Little Bakers to create a new Geek Eats segment, we were beyond excited! We just had to interview Kellie (who happens to be one of the sweetest [no pun intended] people you’ll ever meet) and find out the scoop on their new YouTube show. Kellie spends countless hours in the kitchen whipping up cute and easy fun-sized desserts; she’s all about the tiny treats. 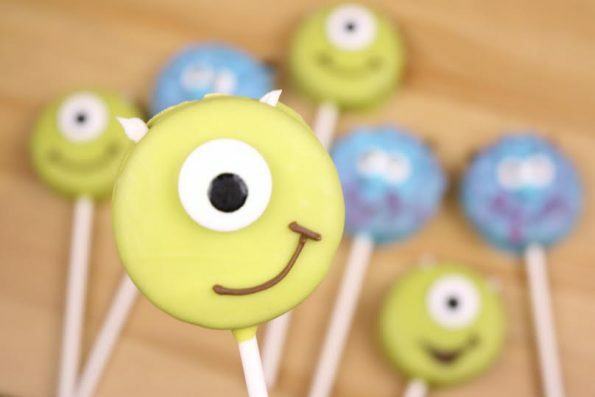 Being a former Disneyland cast member, she loves making Disney-themed desserts, her favorite being her Monster’s Inc. Oreo pops. Since Pretty Little Bakers desserts utilize minimal ingredients and the recipes are simple, Kellie’s overall mission is to give other pretty little bakers the confidence to bake just about anything. How did Pretty Little Bakers come to be? How did the name come about? It feels so cliché but it’s true, I’ve been baking for as long as I can remember (with my momma of course). Once I got older and began baking on my own in college and continued to present day. Baking became a channel for me to be creative, release stress, and to feel close to home. Let’s just say a lot of my free time has been spent in the kitchen (and then stuffing my face). The name came about during a discussion between me and my mentor, Keven Undergaro. Kev is Maria Menounos’ fiancé and he’s had a large role in making Maria as big as she is today. Pretty Little Bakers is basically a play on words to the hit ABC Family show, Pretty Little Liars. Why did you choose baking as your culinary go-to? What is your favorite thing to bake/make and why? Oh boy, you’re killin’ me! If I had to pick one thing… it would have to be my cookie dough pretzel bites. Not only does it combine that salty/sweet factor in each bite, but you can decorate the pretzel bite specific to any occasion! Just last weekend, I brought treats to a Sweet Sixteen Birthday party for Maria and Keven’s dog, Baby, and I decorated the cookie dough pretzel bites in the shape of doggy paws! I just love that these bites allow the baker to be entirely creative! Is there anything you don’t like to bake? Please don’t hate me. I actually don’t like to bake cake. I’m a texture eater (strange but true) and the consistency of cake is just not my cup of tea. That being said, I also prefer baking tiny, fun-sized desserts, so cake wouldn’t fit in that category. 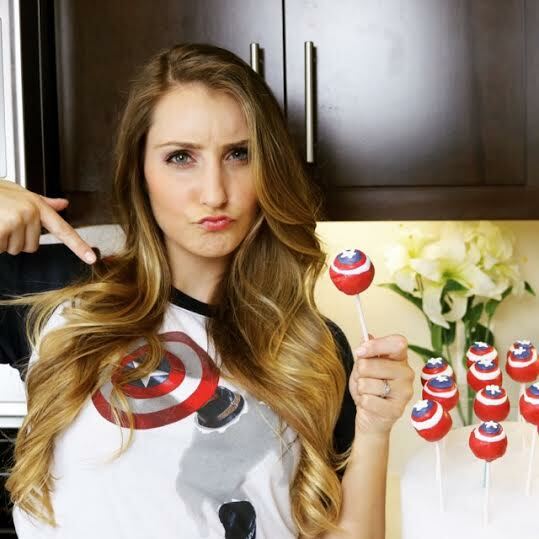 Tell us about your new YouTube video series, A Little Sip of Baking Magic. How did the idea come about? Yes! I’m so excited! A Little Sip of Baking Magic is a new series that I’m collaborating with my good friend Mr. DAPs. He and I met at Disneyland a few years ago and I’ve been on his show Geeks Corner a few times so it was pretty inevitable that we would eventually work together. I’ve come to Mr. DAPs for a lot of advice and help; he’s another great mentor of mine. And he’s just an all-around great guy. I truly honor our friendship so the fact that we’re working together simply thrills me! You also have your own solo series for Pretty Little Bakers, how do you come up with recipe ideas? I do! I push out new videos every week on how to make easy, fun-sized desserts. A lot of my recipes are adapted from other sources. This is the part where I get to be creative and add or subtract various ingredients to my baking. It’s all about trial and error. But as long as you have a strong base, you can tweak a recipe to make it your own. I try to make desserts dedicated to something that happens that week. Perhaps that something is a new movie coming to theaters, or it’s a holiday, or even a national food holiday! But usually there is a purpose for the PLB dessert that week. What tips would you give to home bakers? Remember, anyone can bake! Lots of people think baking is difficult or they may lack confidence, but I promise you, it’s not! With Pretty Little Bakers, we’re working with minimal ingredients, simple recipes, and easy tutorials! I offer easy step-by-step video tutorials and I’m always here if you have any questions about a recipe! I want you to succeed so I’m here to help. What’s next for Pretty Little Bakers? Well let’s see, A Little Sip of Baking Magic is launching this month and this week, Pretty Little Bakers is entering the tech world with an interesting, pop culture-themed dessert. Let’s just say summertime is a fantastic season for Pretty Little Bakers! Because we’re geeks, we need to know, what do you geek out over? Great question! This may be out of the ordinary, but because my world revolves around food, I geek out over bacon. Give me bacon ANYTHING and I MUST try it. Bacon brownie, CHECK. Chocolate covered bacon, CHECK. Bacon milkshake, CHECK CHECK. I’m obsessed. Even with Brussels sprouts (which I’m not a fan of many veggies). If bacon is mixed in with my Brussels sprouts, heck yes, I’ll definitely eat the entire plate. Can you share a recipe with our readers? We want to thank Kellie for taking the time to talk with us (she is one busy lady)! We also wanted to share one of the greatest things she said and that is to “remember, mistakes are yummy”! We couldn’t agree more! For more PLB recipes, check out http://prettylittlebakers.com/. What do you love to bake? Is it cupcakes, cookies, cake? We’d love to hear all about it! Leave your comments below or use the hashtag #GeekEats! Line baking sheet with wax (or parchment) paper. Using the stand mixer, combine meringue powder, water, and salt. Mix on medium speed until it gets foamy. Slowly add the vanilla extract and gradually add the sugar. Whip at high speed for about 5 minutes or until stiff peaks form. Add a few drops of brown food coloring and mix until the color is solid. Add cocoa powder and mix until well combined. Scoop meringue into decorating bag with number 12 tip. Squeeze the meringue down to the tip, twisting the top of the bag so it doesn’t squish out. Begin piping a circle, about the size of a quarter, onto the wax-lined baking sheet and continue piping another layer on top, gradually making the circle smaller and smaller, add one more later, make a swirl at the top and start letting go. Repeat process, spreading the meringues about one and a half inches apart. Bake at 200 degrees for 60 minutes. When finished, turn off oven and leave meringues in the oven for 30 minutes. 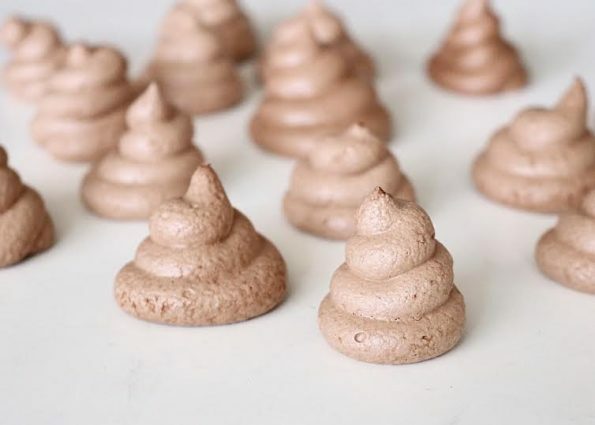 Remove meringues from oven and let them completely cool before touching them.